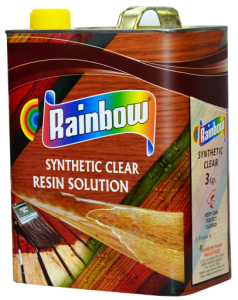 Rainbow Synthetic Clear Varnish is an air drying solvent based varnish having exceptional gloss and excellent abrasion resistivity. 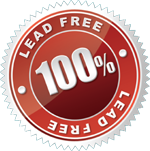 It is suitable for use on all type of new or previously treated wood and metal. Typical use includes paneling, cane or wood furniture, windows, door and partitions. It can also be used in preparing penetrating oil-based filling putty and enhancing further gloss of synthetic enamel. All new wood surface mest be properly seasoned and dry. Apply two coats with an interval of 16 hours between the coats. Rainbow Synthetic Varnish may be added up to 20% in all synthetic enamels to improve gloss. Film Tickness: 25-30 micron per coat. Number of Coats: 2 coats. Application: It can be applied by Brush, Roller or spray. Drying Time: The Surface Drying time is about 2-3 hours, While it can recoated after a minimum of 16 hours. Gloss: Full Glossy Packing: 750 Grams and 3 Kgs.